What’s so compelling about the Draft Perspectives is that we at News and Letters Committees are the only news dissemination block that talks, in depth, about “human” problems worldwide. N&L does not advertise to appease, so we can use words like revolution and (Black, Women, LGBTQ) Lives Matter. We can attack the status quo and the defined hypocrisy, which exists on all levels worldwide. Most importantly, we offer solutions to the problems and we do it in a responsible manner. The violence we see at political rallies is often instigated by irresponsible political figures who feel that they can bully their way into having people accept their ideas. Those who are enemies of freedom are often the biggest hypocrites of all, for they shout from their pulpits of despair, loudly, in order to drown out the cries of desperation of those whom they seek to oppress. Whether in the U.S. or abroad, the war on freedom is being waged with a vehemence that is appalling by any standard. Yet, unless a tragedy like that on the lives of the slaughtered club-goers in Orlando is perpetrated, this war goes largely unreported. The Draft Perspectives is properly titled, “The need for new beginnings in thought and in action.” If we are to give true meaning to revolution, then it is necessary to establish a new foundation for our society and culture to stand upon. N&L, the paper, and News and Letters Committees, the body general, are those tools of change. “Alive in struggle” by Htun Lin (May-June N&L) is a powerful “first-person” article that at the same time stresses the importance of self-activity from below and speaks about the urge of a “revolution in philosophy.” Self-activity from below and revolution in philosophy don’t appear as separate realms. Htun Lin calls self-activity from below “the essential philosophic concrete,” implying that philosophy is internal to workers’ struggles. This poses the next questions: “Is a ‘political revolution’ to ‘save’ capitalism what we need? Is a focus on economic distribution and forms of remuneration under current bounds adequate or appropriate for our times?” He is writing about the need to explicitly develop a “new continent in thought,” a “revolution in philosophy,” already implicit in workers’ self-activity. This is in tune with N&L’s call to unite theory and practice, revolution and philosophy. Htun Lin’s call is strong because a worker, realizing the importance of both self-activity and philosophy, makes it. Monument to the miners killed at Upper Big Branch Mine: “Come to me all you who labor and I will give you rest. Reading “One year for 29 lives” in the May-June issue spurred me to do research. I found out that West Virginia activist Ann Bybee-Finley, a Cornell University Ph.D. student, created the letter-writing project “Making One Year Count.” She hopes that Massey Energy CEO Don Blankenship receives at least one letter each day to make him reflect on the great damage he and his company caused with the 2010 Upper Big Branch Mine explosion which killed 29 miners. To take part in this campaign, folks should go to the “Making One Year Count” Facebook page. Blankenship got only a year in prison, a $250,000 fine and one year supervised probation for his willfully neglectful deadly mining practices and murdering miners. We are pleased to announce that Subjugated Knowledge: The Literary Journal is accepting submissions and applications for editorial positions. There is a certain kind of denigration foisted onto knowledge produced by people in the margins—people of color, queer, agender, gender fluid or gender nonconforming people, immigrants, refugees, people who are disabled, people who have experienced homelessness, people who have been or are imprisoned, and so on. Our goal is to provide a platform for people who are situated within the margins to produce and disseminate knowledge and creative work. The authors of selected pieces will be contacted within one week. Please feel free to contact us if you are interested in an editorial position or if you have any questions or concerns. Thank you, and we look forward to receiving your submissions! The Free Syria rally in Chicago on May Day was very inspiring, as any of their events I’ve been to always are. These freedom fighters are strong and enduring. Part of what made their May Day rally special was that many of the May Day marchers showed solidarity with the Free Syria people. I do wish the mainstream media would cover the Free Syria movement and its fighters…maybe that way the U.S. would firmly support the fight to free Syria. I enjoy this publication and share it with other prisoners. It’s a good educational tool and helps with the expansion of prisoner thought and mental capacity. I wish it had a much larger section to deal with prison issues and struggles. The Bureau of Prisons is now trying to murder me by withholding essential medications, imposing a substandard medical non-treatment plan and denying me colostomy supplies, which can result in fatal infections of the intestines and stomach. My medical and physical condition is such that I should have been transferred to a medical facility as opposed to a penitentiary, which routinely ignores my medical condition. I enjoyed the Draft of the Marxist-Humanist Perspectives 2016-17 and will address particular issues as soon as I become settled in my “new” oppressive existence. I’m a prisoner in a California state prison. I read about N&L in the Prison Activist Resource Center directory and I have the same dream of the abolition of capitalism in any form. I’m requesting a subscription to N&L. 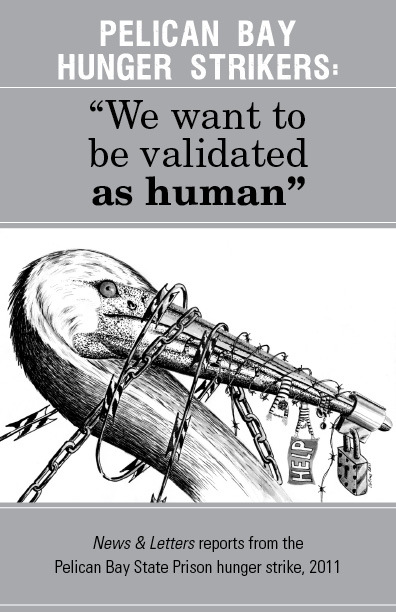 Pelican Bay prisoners speak: We want to validated as human.” To order a copy click here. Thank you for providing a voice for the few who have no other voices speaking out for them. Please place me on your subscription list and send me a copy of the pamphlet on the Pelican Bay Hunger Strikers. I’m in the SHU at Florence awaiting a transfer to an LGBT-friendly yard so I can go home when I’m supposed to. I’m new to fighting for LGBT/prisoners’ rights to be free and ending caging people. That’s clearly not the answer or prisons and jails alike wouldn’t be revolving doors. I’d love to receive your newspaper as well as participate in it. Without the courage to speak out, no one would know the struggle, pain and torment this place causes. TO OUR READERS: Can you donate $5 for a prisoner who cannot pay for a subscription to N&L? If so, click here. This entry was posted in Articles and tagged Ann Bybee-Finley, Black Lives Matter, capitalism, Don Blankenship, draft perspectives, Elise, Fernando Bustillo, Free Syria, freedom, Hector, Htun Lin, Kaitlin, lgbtq, Making One Year Count, Massey Energy, May Day, miners, News & Letters, News and Letters Committees, Orlando Florida, Pelican Bay Hunger Strikers: "We want to be validated as human", philosophy, Prison, Prison Activist Resource Center, prisoners, revolution, Robert Taliaferro, Security Housing Units, self-activity, shu, Subjugated Knowledge: The Literary Journal, subscription, Syria, theory and practice, U.S. Bureau of Prisons, Upper Big Branch mine explosion, West Virginia, workers. Bookmark the permalink.